2018 kicked off with the oficial award ceremony of the Chilean Circle of Art Critics during which the 16th venue of ETF! 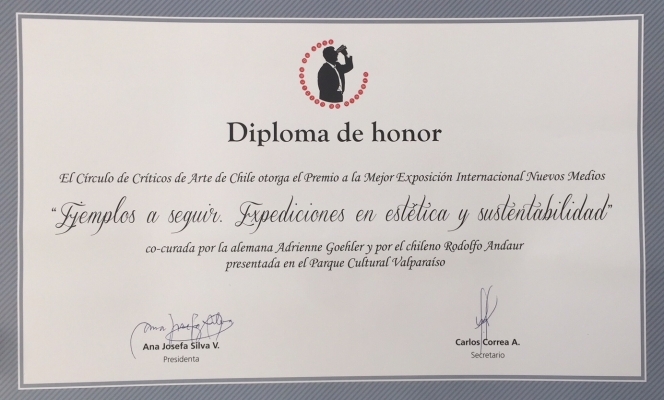 has been awarded unanimously the best international exhibition of 2017 in Chile. Representatives from Heinrich Böll Cono Sur and Parque Cultural de Valparaíso where there to accept the award. This station, which was shown from 10.6.17 – 12.8.17 at Parque Cultural de Valparaíso, was made possible by Heinrich Böll Stiftung Cono Sur, Institute for Advanced Sustainability Studies in Potsdam and Goethe-Institute Chile and . ETF! wants to thank all our artists, partners, technicians, helpers and everyone who made this possible. Under this link you can see the pictures and a video from the exhibition and the dialogue program.